As I've written about before, I don't know how I can solve the problems of many of my friends. The issues are daunting. Chronic poverty. Drug addiction. Mental illness. Physical disability. Cognitive disability. I can't fix it or make it go away. But I can be a sacrament. I can be sign of love, a sign of life. I can be a friend. In a cruel and inhumane world I can be a location of kindness. Before various church audiences I've described this as "sacramental friendship," calling them to form friendships across the socioeconomic spectrum. The focus of this call is upon relationality--walking alongside others in friendship--rather than starting up "a program" to "address" poverty. And to be clear, such programs are needed, but what I find lacking in many churches is friendship, a face-to-face, first-name-basis relationality between rich and poor. This is what is missing in many churches. Programs abound but there is too little friendship. And in many ways this call for friendship is both harder and easier than starting up a poverty program at the church. It's easier in that you don't have to save the world. You don't have to eradicate world poverty. You just have to be a friend. To be sure, you'll be faced with issues regarding material want. But the needs of your friends will be expressed within a relational context. And because of the friendship you'll be able to discern the legitimacy of the requests and, given your knowledge of your friend, how best to respond. And most importantly, the situation will be reciprocal. Your friend will be giving to you as well. Perhaps not materially, but there will be life-giving exchanges flowing back and forth. So in many ways, being a friend is much easier than trying to save the world. And yet, it's also much harder. Your life will get messier. You'll have to struggle with how best to help your friend and those decisions can be heart-breaking at times. Volunteering a few hours at the food pantry or sponsoring a child in Africa is a whole lot easier and cleaner than making friends and opening up your life to the needs, demands and sin of others. To say nothing of how your needs, wants and sins will affect them. And yet, while friendship can be a really difficult thing, when I've made this call for sacramental friendship some have struggled with what sounds like resignation. You can't alleviate poverty but you can be friends with the poor. But doesn't that just leave the status quo intact? Should we not do more than be friends? Yes. So let's not set up a false dichotomy. In speaking about sacramental friendships I'm not asking people to choose one thing over another. This isn't an either/or. We must do both. And yet, and this gets us to the point I want to make, I do think sacramental friendships can lift people out of poverty. It might seem that you are "just being friends" but that friendship can, in many ways, be a ladder out of poverty. There have been some recent studies about the factors associated with chronic poverty and one of the things that has come into view is that one of the biggest factors related to poverty is concentrated poverty. When people live in concentrated poverty, where the poor are living only amongst the poor, they have a much harder time escaping the poverty trap. Many things come to time. We might talk about the role of culture, norms, mentors and role models. A young person growing up in concentrated poverty may need to see a better world and come into contact with role models and mentors so that dreams and personal initiative can develop. But another key part to this has to do with the erosion of social support. In generations past the community was your insurance policy should anything traumatic happen to you. From a family death to the loss of a crop to a barn burning down. People and family would rally around you, supporting you through a difficult time. So to be clear, I don't want to lament a decline in cultural and family values and then put that decline solely on the poor. The decline cuts across socioeconomic status. It's just that the rich have been able to insulate themselves from the historic erosion of familial and social mutuality. The rich can be self-sufficient. Thus, the social decline in America has fallen hardest on the poor. But it's not just that the poor have lost the "social safety net." The poor, especially in locations of concentrated poverty, also lack a diverse web of friendships that can support them and help lift them out of poverty. In areas of concentrated poverty the poor lack what has been called the strength of weak ties. 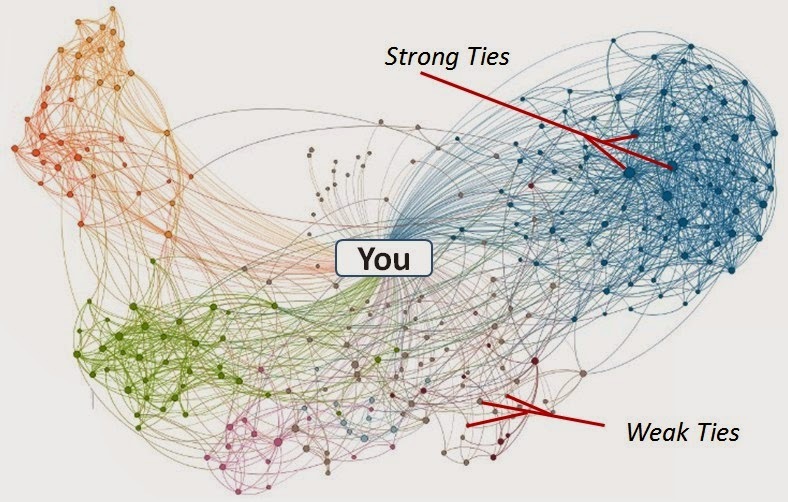 The strength of weak ties goes back to a seminal article written by Mark Granovetter in 1973 entitled "The Strength of Weak Ties". One of the things Granovetter looked at in his article was how college graduates found jobs after graduation. What Granovetter noticed was that graduates did not find jobs through their close friendships (strong ties). Rather, jobs were located more through acquaintances or distant family relationships (weak ties). The reason for this, Granovetter noted, is that our close friendships (our strong ties) are often tightly connected bundles of sameness. Thus, trying to rely upon your close friends for help in finding a job is ineffective as close friends tend to already know all the same people. Strong ties don't help you break out of your social niche and location. To be sure strong ties are vital in getting through life. We all need a close group of friends to lean on. But close groups of friends can also be limiting in their insularity. According to Granovetter, what helps us escape the insularity of the close friendship group is the weak tie, the acquaintance or distant relative. That's how people tended to find jobs. They had a friend whose brother worked at a certain place or in a certain city. Why don't you give him a call? To be sure, that call might not produce a job offer, but it might produce another job lead via the weak ties of the person you just called. The point being, these weak ties are weak but they help you escape your social world and cover a lot of social territory very, very quickly. Which is just what you need during a job search. You need lots of leads in lots of different places. Friends often can't help you with that, but their weak ties can. That is the strength of the weak tie. I hope you can see how in areas of concentrated poverty there would be a scarcity of weak ties. Even if the poor in a neighborhood did rally to each other in times of need--and they do do this in ways the rich do not--they lack the rich and diverse social relationships--the weak ties--that can help each other escape poverty. On the surface we might think that "just being friends" isn't doing anything to help lift a person out of poverty. But what we fail to notice, particularly in locations of concentrated poverty, is that the sacramental friendship is enriching the social web. The number of weak ties has been increased. And these weak ties may be the very resource the person most needs. In sacramental friendships you are bringing the gift of your weak ties. Let me give a concrete and personal example of this. Jana and I have lots of friendships at the margins because of a church plant we worship with. And by and large these friendships are sacramental. We've not eradicated poverty or homelessness, but we walk alongside those who are homeless and poor. And while this has been an amazing and life-giving blessing, this situation can feel fairly static and futile at times. But we have a friend who doesn't have any teeth. And this poses a suite of issues for our friend. Specifically, it can affect employment prospects. Because of our friendship we've heard the prayers of this friend for some new teeth. Trouble is, Jana and I aren't dentists. And a set of new teeth is thousands and thousands of dollars. But Jana has a weak tie with our dentist. Specifically, our dentist was a former high school student of Jana's many, many years ago. That's not a huge connection, but it's enough of a weak tie that at her next dental appointment Jana shared the plight of our friend. And our dentist responded, offering to do the work at cost, getting us down to hundreds rather than thousands of dollars. And so it is that we are getting our friend some new teeth. And it happened because of a weak tie. Our friend knew Jana who knew a dentist. Jana couldn't help directly, but Jana had a weak tie to a person who could. Again, the gift you bring isn't yourself, the gift you bring is who you know. The examples abound. Do you know people who can fix a car, help with a computer, or who can do basic electrical work? Do you know someone who works at a place that is hiring right now? Do you know, perhaps, a dentist? These connections, weak as they may be, can be lifelines. Lifelines and connections that are lacking in locations of concentrated poverty. Lifelines and connections that are more important than ever given the erosion of our social and familial webs of support. Which brings me back to sacramental friendship. On the surface it might not look like a sacramental friendship is doing much to change the situation of the person in poverty. But what that sacramental friendship is doing is enriching and diversifying the social connections of the person you are friends with. You are increasing their portfolio of weak ties. And that portfolio, should it become rich and diverse enough, can provide the social resources needed to lift a person out of concentrated poverty. Your weak tie might lead to a dentist and some new teeth. And those new teeth might lead to a better job interview. And that better interview to a job. And so on. We tend to think that it's our job to save the world. But maybe it's not you or I who saves the world but the people we know. Or the people those people know. Maybe what saves the world isn't lone rangers of social justice. Maybe what saves the world is relationships, rich webs of social connections. Messy, complicated sacramental friendships might not seem to be an anti-poverty program but it may be the most important thing the church can to do help lift people out of poverty. Yes, we give the poor food and clothing as these are vital and necessary things. But what the poor may need most is our friendship. "Do this to remember me." Do you think that your "sacrament of friendship" may be as much or more of the intent in this command than the symbolism? I do, and your words here have helped me articulate more of why I think so. This is phenomenal and subversively revolutionary. I agree, we can't necessarily do away with the programs and safety nets, but the web of relationships that we build and connect with... that's where the real, boots on the ground work happens. Thanks for this. The question--"Where do I tangibly see the kingdom of God?" --has dominated my thinking recently. I think these "weak ties" are one answer to that question. Now, I just need to find those weak ties. Love this Bro. Richard. 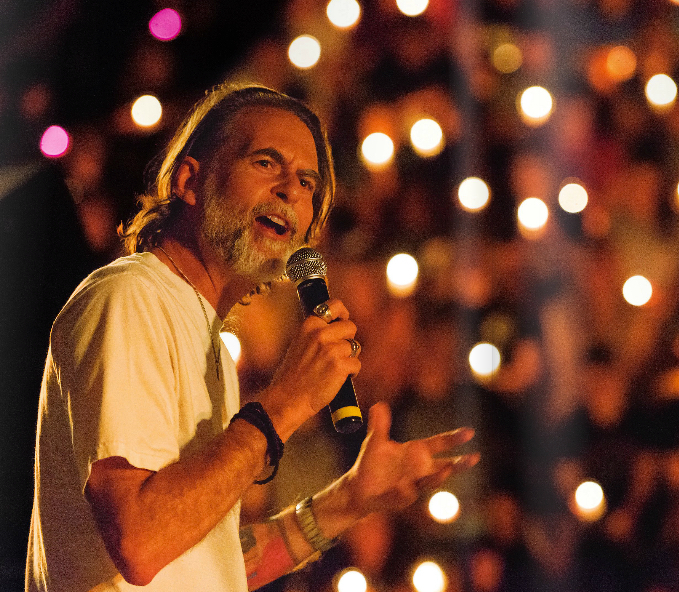 We can't save the world by ourselves, but the gift we bring is the community we belong to. I love the story about Jana and the dentist. So glad you both are in so many people's lives. Thanks for that link. Yes, feel free to share/copy/publish this. That's why I write here, to share. My friends tend to come from the people I rub shoulders with on a daily basis. People from work, people from church, people I meet while dancing (social dancing is a hobby of mine), most of them solidly middle-class. My question is this - if my daily activities don't bring me into contact with people from a lower socioeconomic class, where can I go and what can I do to come into contact with these potential friends regularly enough to establish a friendship with them? I figure if I want to meet rich people, I could join a country club, but where are the places the less advantaged folks hang out? Richard, not to debate the literalness of the account of THE ROAD TO EMMAUS in Luke 24, but John Dominic Crossan, in writing of Jesus breaking bread with the two disciples said, "The Road to Emmaus never happened; yet, it is always happening". Great post, Richard! This reminds me of your "Alone, Suburban, and Sorted" series and rekindles a set of ideas I've had about all this. Thanks! Fantastic stuff. The story about Jana at the end reminds me of asset-based community development, which focuses on gifts, possibilities, and relationships rather than needs, deficiencies, and disconnection. In many ways, it's approach is founded on weak ties. One of the "founders" of this approach wrote an essay called "Why Servanthood is Bad," in which he critiques the common Christian development paradigm as disempowering (among other things). 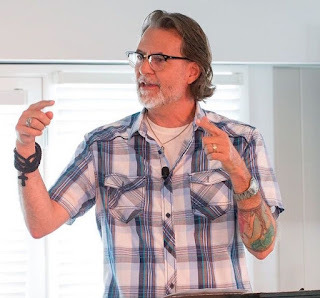 I also thought about the amazing connections (weak, of course) between weak ties and Caputo's weak theology . . .
Love this! Sometimes I am so quick to fix that I forget the person. "But what the poor may need most is our friendship." Indeed. And what the rich may need most is their friendship. Indeed. My friends gave me my faith back. And with that, my life. Great thoughts here. This also sums up why I have been feeling so disaffected with the refugee ministry that my congregation is doing. The focus has been on seeing the refugees as objects of charity. They come, we give them stuff, they go. We're not invested in them at all. No wonder there's no direction for these efforts and less and less inspiration to take part in them. Of course, when I say "my congregation," I'm speaking out of habit now. Since, as of yesterday, I am sadly no longer a part of this congregation. But this is something I can take with me for my future efforts, whatever they may be. Weak ties.... FACEBOOK! Nothing screams weak ties like Facebook. So I guess a huge "friend" list on Facebook what we all need to help the world. Thank you so much for taking it further and fleshing it out - I love this. As a Chinese person, our interconnected web of relationships is crucial to functioning in society but I love this connection to bringing about justice for the poor. Really, though, what is distinctly Christian about any of this? More and more I have been failing to see the need for Christianity as a reason to help others. You tag "sacramental" onto the whole deal without their being any real need for doing so. More often than not, American Christianity and church get in the way of this kind of work. This is just what I need to hear right now. I have been in such a quandary about how to help some friends who are poor but are not doing what they can to change their situation. This give God space to work too. Just like he opened up the way for your friend to get teeth. Thank you so much!! What you write about his confirms my experience. During a period in the 90's I helped out with the prison "ministry" at my church (at the time). It took awhile for me to learn this, but approaching the people as a "ministry" objectified them and created barriers. When I began to see the people I was coming in contact with as "acquaintances" who were potential "friends" the whole dynamic began to change--starting with my heart. Look for a place to teach English as a Second Language. Immigrants and refugees need cultural brokers who can help them navigate the community. You will soon realize that the person bagging the groceries or bussing the table, or cleaning the church has a rich story waiting to be told if only someone will listen.